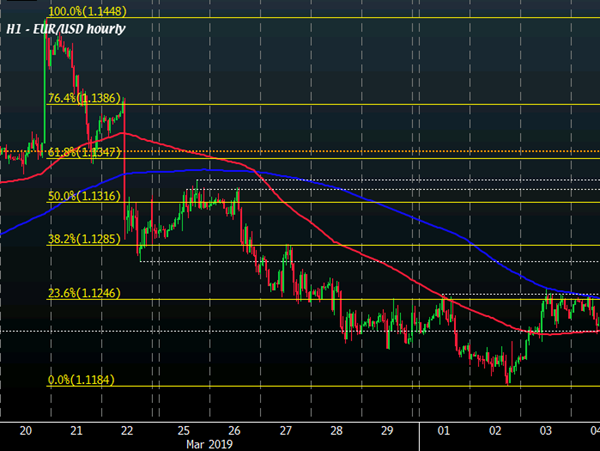 UK retail sales holds firm in Q1 as March data beats expectations ForexLive But that isn't enough to really generate much buzz in the pound with cable rising from 1.3010 levels to 1.3030 following the data release. Not that it's much of a surprise as despite the data beat, pound sentiment remains largely dependent on Brexit at this point and the earlier release doesn't really do much to change that picture. A move below will be eyed by sellers now followed by the 126.16-21 area The falll from the high today moved down to test the rising 100 hour MA, and that level has stalled the fall (so far at least). Dip buyers, looking for more upside (and move above the ceiling) are sticking a toe against the MA level, with stops likely on a break below. Like at the highs, risk is defined and limited. 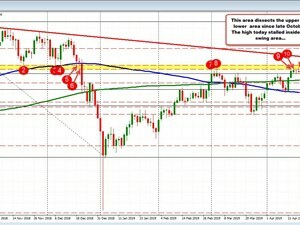 100 hour MA eyed below The USDJPY is sputtering near topside resistance, but holds on to more bullish bias. Looking at the daily chart above, the 112.076-279 area is home to swing levels going back to late October (it dissects more bullish and more bearish). The highs this week (and on Friday), have seen sellers leaning in that area. Today, the high reached 112.159, and backed off. Buyers could not push to and above the 112.279 level. 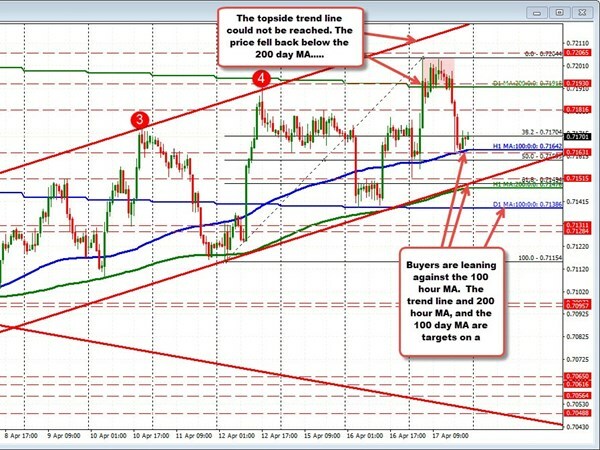 The GBPUSD trading in a channel The GBPUSD is trading in a channel with more of a bearish bias. 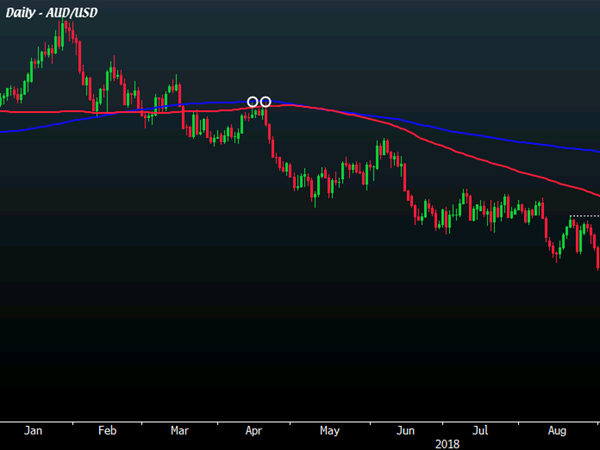 The price also traded below the 200 hour MA today. Yesterday, that MA was busted early in the NY session, on reports of stalls in Brexit negotiations, and stayed below that MA for the rest of the day (see green line at 1.30699). The high today reached 1.30663 and reversed lower. Going forward, if the bulls are to push higher, that MA would need to be broken. 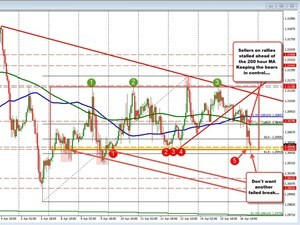 Move lower early in the sesson just can't keep the momentum going The EURUSD set a double top in trading in the London morning sesssion at the 1.13233. When the price cannot extend above a prior high, it sours the mood of the market traders. The USD Is mixed. As the NA session begins, the AUD is the strongest helped by stronger China data overnight. while the NZD is the weakest. It was hurt early by weaker CPI data (but did recover part of the losses on the back of the China data). 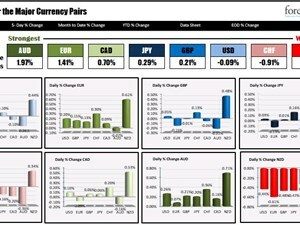 The USD is little changed overall with gains vs the NZD and CHF and declines vs the AUD, CAD and EUR. The greenback is little changed vs the GBP, JPY in the morning snapshot. 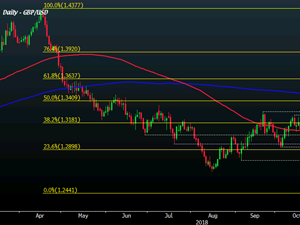 GBP/USD slips from 1.3060 to 1.3040 levels ForexLive The pound also slips to the day's lows against the euro with EUR/GBP rising to 0.8680 on the back of the report earlier. Meanwhile, cable is inching lower towards 1.3040 currently as the data misses on expectations. 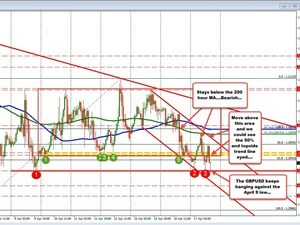 GBP/USD trading range continues to be defined by triangle pattern ForexLive At 0830 GMT, there will be the release of UK inflation data for March and though the data may have short-term repercussions for the pound, it isn't an imminent game changer as Brexit remains the major driver of the currency. AUD/USD is knocking on the door of an upside extension, but buyers must be able to hold a daily close above the 200-day moving average first ForexLive It's yet another make or break time for AUD/USD buyers as they contend with the 200-day MA (blue line) once again. 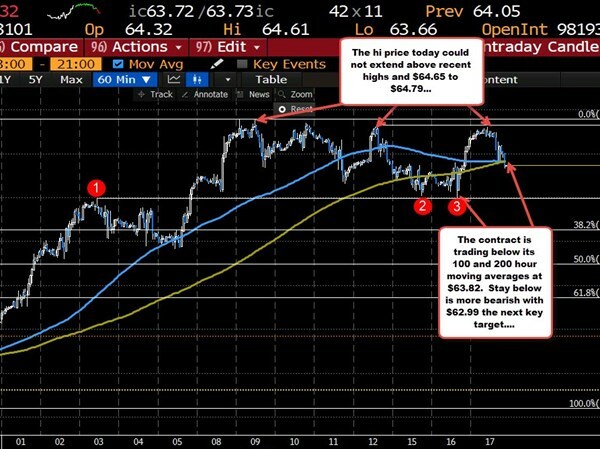 This time around, price manages to trade above it for the first time since March 2018 but the issue is can buyers hold a daily break above it? 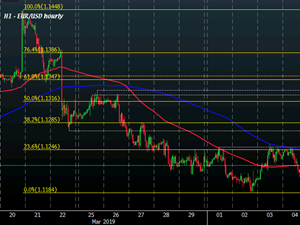 EUR/USD holds above the 1.1300 handle in early European trading ForexLive The dollar and yen are holding a little weaker as we begin the European morning as markets look to be leaning slightly towards a more risk-on mood. Chinese economic data earlier mainly helped markets breathe a sigh of relief, easing some fears on global growth. 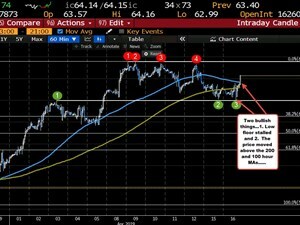 Netflix earnings after the close The major stock indices have given up a lot of their gains on the back of concern about North Korea. Nevertheless, the major indices are ending the session higher. 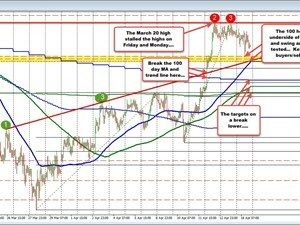 AUDUSD above the 100 hour MA but below the 200 day MA The traders in AUDUSD tried to go lower off the back of the RBA meeting minutes in the Asian session that led traders to think a cut was in the cards. However, despite the fall, the price stalled at the 100 day MA (see overlay at 0.7139 level in the chart below). Up $0.65 or 1.03% on the day The price of crude oil futures are settling the day at $64.05. That is up $0.65 or 1.03%. The high today reached $64.12. The low reached $62.99. The pair is settling right near the highs. 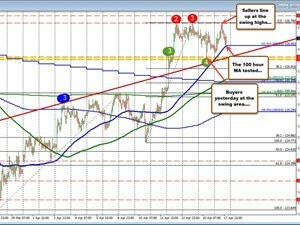 Will the sellers in the EURJPY keep the pressure on the pair The EURJPY has backed off a ceiling at 126.78. That ceiling was started back on March 20. On Friday the high reached 126.76. The high on Monday reached 126.784. The last three highs all within 2 pips of each other. 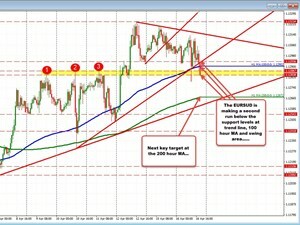 EURUSDs earlier break below trendline, 100 hour MA and swing area failed The EURUSD is making a second run below support levels today. 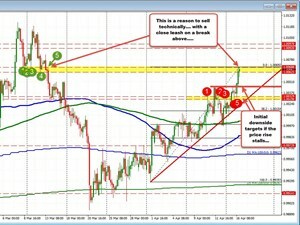 Earlier in the day, the pair fell below a trend line and 100 hour MA AND a swing area in the 1.1284-867 area. That break failed. The price moved higher. 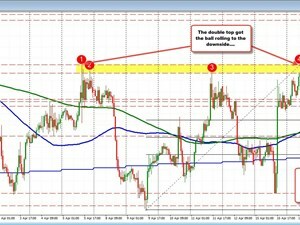 USDCHF reaches a swing area target. Sellers put a little lean against the resistance. 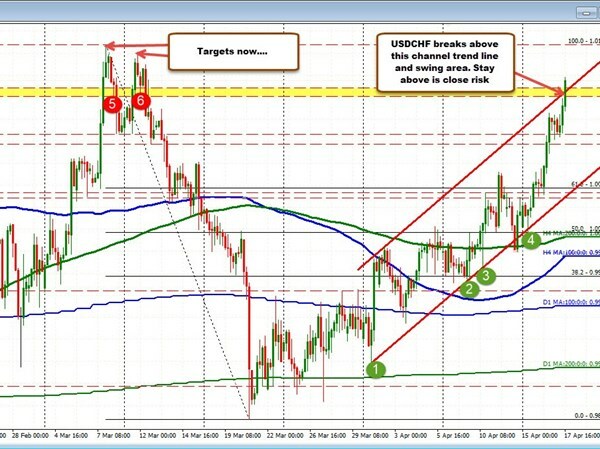 The USDCHF has resistance at 1.0062-69. Testing now. 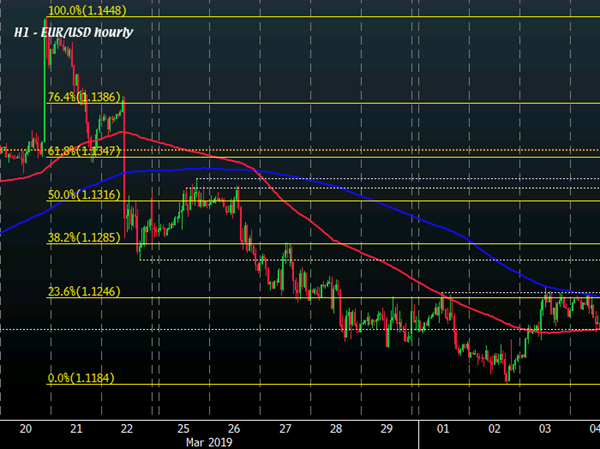 Lookiing at the 4-hour chart of the USDCHF, the price has been trending higher this week, helped by weekend comments from SNBs Jordan that they could cut and/or intervene. European shares close higher on the day led by the German Dax. 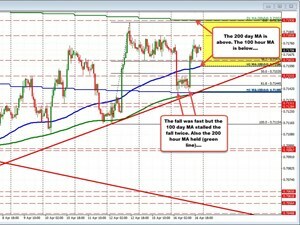 Stayed below the 200 hour MA but failed break in the GBPUSD being eyed , the fall below the 100 and 200 hour MA did find early sellers against that MA level. Bears stay in control. Double top formed at the high today Canada Manufacturing sales were weaker than expectations at -0.2% vs -0.1% (revision lower to 0.8% vs 1.0% previously). Crude oil is higher by $0.12 on the day at $63.51 but off the highs at $63.79. Despite those "more negative for the loonie" facts, the CAD has moved higher. So technicals and flows seem to be a driviing influence. However, with the MAs holding, perhaps the sellers are looking to reverse the bias once again. 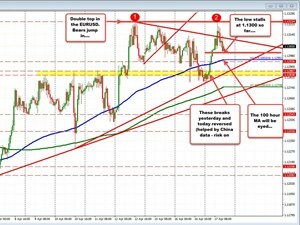 Watch for support against the MAs below (with stops on a break below).